A quick practice for the first dance set the stage for the perfect sunset wedding picture. 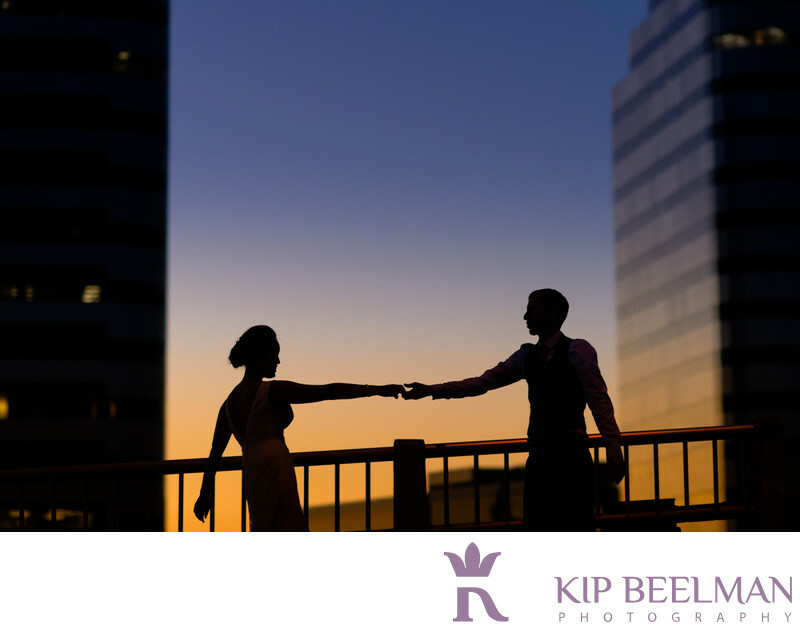 I love the color of the sky and how the tall buildings perfectly frame the couple, showcasing the beauty of the sky as well as the urban setting at Melrose Market Studios in Seattle, just one of the cool places we captured throughout this couple’s wedding day. Wedding photography started at Hyatt at Olive 8 where the bride got dressed and ready; meanwhile, the groom prepared for the day in the couple’s modern, chic 33rd floor Seattle condo home. The wedding ceremony was held tucked in a charming grove at Volunteer Park, which offers a wonderful and scenic backdrop for such occasions. The newlyweds then hosted a picnic with lemonade and sweet tea after, and an ice cream truck played its tune and offered sweet treats for the wedding guests. The magic continued on at the historic Melrose Market Studios, a creative and lively event space on the west edge of Capitol Hill in Seattle that features red brick walls, huge Douglas fir beams, high ceilings, a polished concrete floor and amazing lighting for wedding photography – including this breathtaking outdoor lighting. The wedding was beautifully planned and coordinated by Amanda Rose from Oak & Cypress Weddings and it featured phenomenal catering by Lisa Dupar as well as lovely music by the Jason Parker Quarter. This creative couple even engaged painter Sam Day to document the reception scene live, creating another keepsake for their colorful wedding album. Location: 1568 Minor Ave, Seattle, WA 98122. Keywords: Garden Wedding (15), Melrose Market Studios (3), Outdoor Wedding (72), Seattle (111).